UNICA's new Washrack Dolly is constructed of heavy-duty polyethylene with stainless steel handle to withstand the heavy usage in and out of your kitchen. 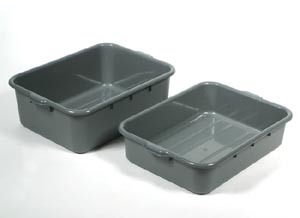 It is the perfect complement for your UNICA Ware Washing-Handling System! 1 Set 10.14 kg Gray Approx. 1 Set 8.54kg Gray Approx. Protect your valuable stemware from dust and dirt. UNICA's new Washrack Dust Cover does the job. Use together with UNICA Rack Cover and UNICA Dolly for the complete solution. 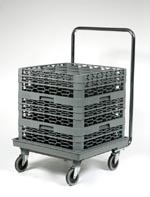 This strong and sturdy trolley is a great helper in and out of the kitchen. 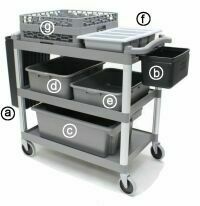 This versatile trolley can be used to transport your prepared food to the serving area and also to transport and collect your used dishes back to the kitchen. used utensils and dishes back. Available now in 2 colours. better protection of shelf contents. 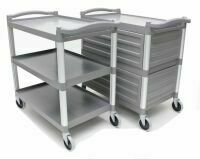 Our UNICA Busing System is the perfect complement for our 3-Tier Trollery yet flexible enough to be used on most standard utility and busing carts. 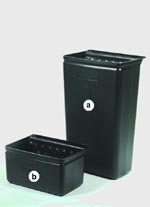 Made from HDPE, our bins are strong and easy to clean. Collecting your silverware and food waste has never been easier. 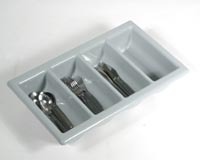 Made to last, the UNICA 4 Compartment Cutlery Tray (Gastronom Size) with its large compartments, is ideal for storing all your different cutlery. The rims are reinforced so that they are strong enough to withstand all the handling. Our 8-compartment Flatware Basket has been specially designed with its mesh design on the bottom and sidewalls to allow for maximum water circulation for thorough washing and drying. Designed to be able to stack upon one another when not in use. Lightweight and yet able to withstand constant usage. UNICA Bus Boxes come in both the popular 7" and 5" sizes. For all your bussing, display, storage, collection, transporting, washing or handling jobs. 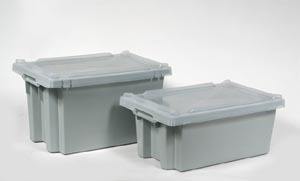 Standard in size and efficient, they stack onto each other to conserve space. 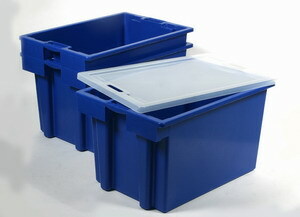 Use them together with the UNICA 3-tier trolley for easier transport. 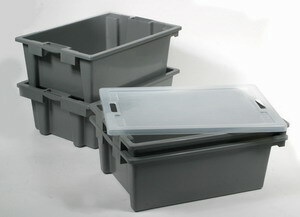 Ergonomically designed sturdy and rigid box that is versatile in use. Can be stacked on one another to maximise storage. When not in use, it can be nested. Specially designed locking holes on both body and cover allows for sealing protection. Suitable for Confectioneries like dough, cookies, buns, breads, cakes, pizza etc. 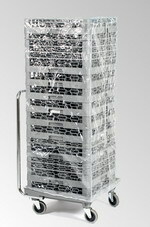 Art no: 8810, 8811 and 8812 are stackable and covers are available for hygenic protection. Note: Only Art no. 8811 and 8812 with cover.